Excalibur posts are available in 4 styles and 3 lengths. Pre-welded iron railing components provide strength, while its' triple-coat finishing process ensures durability. 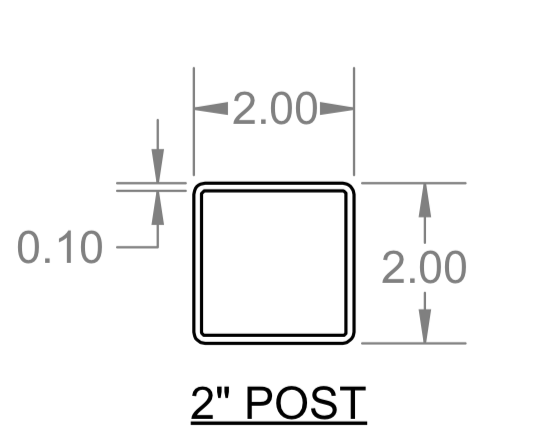 The pre-mounted brackets allow for quick installation Brackets are welded to each post at precise heights for easy Excalibur panel installation. Each post comes with a welded flange at the bottom of the post with pre-drilled holes for easy installation to deck or patio. 34" panels can be installed at a finished rail height of 36" with a 2" bottom space post or 38" with a 4" bottom space post. 40" panels can be installed at a finished rail height of 42" with a 2" bottom space post or 44" with a 4" bottom space post. The two inch posts were fairly easy to install. It helps to have a post level. 3/8 inch by 3 inch screws secure the posts very solidly. The trim posts are low profile so which is the look we wanted. We wanted the railing and posts to "disappear" as we enjoy our view. Super happy with the quality of the product and ease of installation.